September is finally here. The "ber" months (my favorite months) have arrived at last - September, October, November, December. I'm a sucker for all things Fall - the fashion, the foliage, the festivites, and... the food. Love the stuff. Food just tastes better this time of year. Last night my sister, Sheila, threw together the perfect pot of spaghetti - the best. And I think it tasted extra-specially-good because... she simmered the sauce for a long time? No. Because I had calories saved-up? Possibly. Or because it's September and the mornings are slightly cooler and I just saw the first-of-the-season Pumpkin Spice Latte advertisement at Starbucks this week? That's got to be it. And sure, spaghetti is great and all, but I've got a thing for food that is dessert-in-nature. Chocolate chunk cookies, oatmeal cake, cinnamon rolls. Preferably homemade - Molly's homemade. I like to bake more often than "cook." And Fall kicks off my baking-more-than-necessary season. A friend and I used to joke that baking is a form of therapy. We would say that if we ever catch each other in the kitchen, we'd have to ask what's wrong. "Molly, you're baking again. Is everything okay? Is their a deeper issue here?" Well, nothing that sour cream crumb cake and a cup of coffee can't cure. But on occasion, I do put my baking to good use. I once made brownies for a... uh, challenging neighbor. You know, a peace offering. So I walked over, knocked on the door, smiled and said, "I made some brownies for you guys." And she looked at the plate, rolled her eyes, and said, "Are there nuts in those?" Like I was carrying a plate of baby rattlesnakes. Now, doesn't she know she's supposed to hide her gut-reactions from people? Like maybe every morning in the mirror she should practice a face that says, "Look, brownies! With or without nuts! So excited!" But instead, she put me in a funk. So I wonder sometimes, does what I do - big or small - make a difference? Even though appearances may show the recipient could care less, should I continue being nice? Did the Spirit of God use my brownie-gesture at all to soften my neighbor's heart? Or my heart? He must have been up to something - or else I may not have played very nice. So the encounter wasn't meaningless and hopeless after all. Romans 5:5 says, "And hope does not put us to shame, because God's love has been poured out into our hearts through the Holy Spirit, who has been given to us." Come to think of it, brownies all by themselves are really good. But brownies topped with ice cream? Extraordinary. 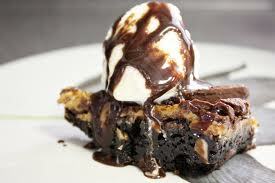 What ice cream is to brownies is what God is to my life - so to speak. And as I invite God into my comings-and-goings this Fall season, I trust he'll "top" my days with much-needed joy and purpose, and more often than not lately, ice cream.